The Interplanetary Transport System envisions humanity not only colonizing the Red Planet, but establishing a solar system-wide transportation infrastructure. Speaking at the 67th International Astronautics Congress in Guadalajara, Mexico, SpaceX founder Elon Musk revealed his company’s stunning vision for the colonization of Mars (and beyond) in the form of the Interplanetary Transport System (ITS). The ambitious plan will answer the question “why go anywhere?” said Musk at his highly anticipated announcement on Tuesday. In short, the ITS isn’t only a rocket and spaceship that will get us to Mars, it will form the basis of an interplanetary transportation system that could allow humanity to explore the entire solar system while side-stepping this existential threat. Ever since Musk’s private spaceflight venture was started in 2002, blowing up rockets in the South Pacific until the first successful Falcon 1 launch in 2008, he has made his intentions clear for SpaceX. But Tuesday’s presentation went beyond transporting people and equipment to the Red Planet’s surface, Musk wanted to emphasize that we need to establish something more than a human outpost. Although the Apollo program, which eventually landed astronauts on the moon in 1969, was “one of the greatest achievements for humanity,” if we were to use a similar rocket system to get astronauts to Mars, it would cost around $10 billion per person, said Musk. The ITS, which will consist of a massive rocket (that will dwarf Apollo’s Saturn V) and spaceship that will carry at least 100 people, could drive launch costs down to less than $140,000 per ton. “It’s a bit tricky … we have to improve the costs by 5 million percent,” said Musk. 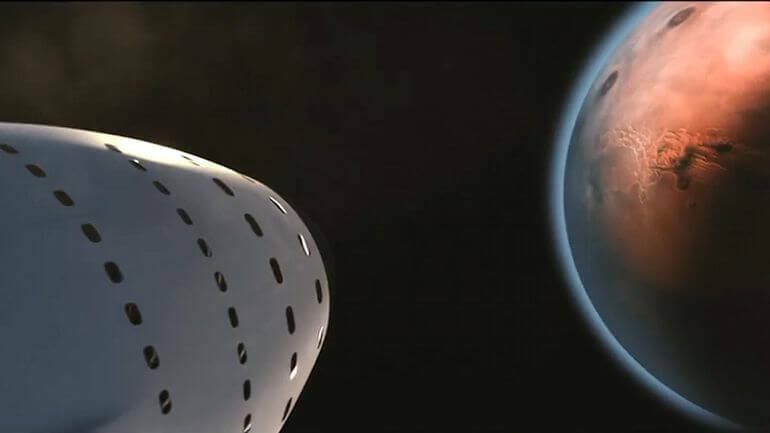 Through a combination of reusable rockets and spacecraft, Musk says that SpaceX could set up regular flights between Earth and Mars, roughly every two years when the planets’ orbits come close. Assuming a self-sustaining colony would consist of around a million people, and assuming each ITS flight would carry 100 passengers, 10,000 launches would need to be carried out. In the long-term, a million people could live on Mars in 40-100 years. But Musk isn’t only thinking about setting up a Martian city, that’s just the beginning. Of all the planets in the solar system, he argues, Mars has the best mix of natural resources to support a human presence. Mars has nitrogen, for example, that can be used to support crops. Fuel can also be manufactured in-situ to allow spacecraft to launch and return to Earth. But we know that Mars was once a lot warmer and wetter than it is now, so there’s the possibility of adapting the planet to make it more habitable for humans. “If we could warm Mars up, we would have a thick atmosphere and liquid oceans,” he said. Key to the ITS infrastructure will be the manufacture of rocket fuel on Mars and the placement of fuel depots in Earth orbit and elsewhere in the solar system. The Mars-based fuel factories will ensure reusability of the ITS spaceships, so they can operate regular flights between planets and prevent a “spaceship graveyard” from forming on the Martian surface. The in-space fuel depots would allow rockets to launch from Earth with a minimal quantity of propellant required to leave Earth’s gravity and reach a transfer orbit around Earth. Refueling in orbit will then take place, giving the spaceships enough propellant for the rest of their trip to the Red Planet’s surface. And with this system in place, “you can go planet hopping or moon hopping,” allowing us to move beyond Mars with the help of strategically placed propellant “filling stations” along the way. “By establishing a fuel depot in the asteroid belt or on one of the moons of Jupiter, you can make flights from Mars to Jupiter no problem,” he said. “This system really gives you the freedom to go wherever you want in the greater solar system. Arguably, the biggest challenges facing Musk’s vision for ITS are funding and time. The technology is certainly getting there. Recently, SpaceX carried out a successful test of the Raptor rocket engine that is planned to launch the ITS into space. 42 Raptor engines will provide over 28 million pounds of thrust at lift-off. The backbone of SpaceX’s re-usability, returning the first stage of a rocket to Earth after launch for eventual re-use, has seen multiple successes and Musk is keen to improve the Falcon 9’s precision when landing so that technology can be scaled up for the ultimate ITS launcher. During his presentation, Musk also showcased the gargantuan carbon fiber fuel tank that is being tested for the eventual use in the ITS rocket, emphasizing that components for ITS are already being built and tested by SpaceX. But where will SpaceX get its funding to set up this space transportation infrastructure? The company intends to continue launching cargo for NASA to the International Space Station and satellites for private companies, a business model it sees as highly profitable over time. Also, Musk pointed out that private businesses will have an interest in setting up a sustainable city on the Red Planet. Public and private partnerships will also play a large role. Although the exact details of these funding programs remain understandably vague for the time being, Musk is hopeful: “As we show that this is possible, that this dream is real … I think support will snowball over time,” he added. Whereas other plans to colonize Mars have amounted to little more than wishful thinking, Musk’s plan is based on the the scaling-up of existing SpaceX technology. Only 8 short years ago, the company succeeded in launching its first Falcon 1 rocket and now the company is delivering supplies to the space station, landing rockets and sending commercial satellites into space. Could ITS be SpaceX’s next big technological success? Although the company has suffered two catastrophic setbacks in the last 18 months, if Tuesday’s announcement is anything to go by Musk’s dream to see humanity as a multi-planetary species isn’t wavering.